Last year after Valentine's I picked up a pack of these cute tubs of Valentines Play Doh on clearance. They came with little to/from stickers but I wanted to make them just a little bit cuter. I created a bag topper that says, "You make me feel "squishy" inside and put a couple in a snack size ziplocks. Much cuter! You can download the bag toppers HERE if you want to make your own. 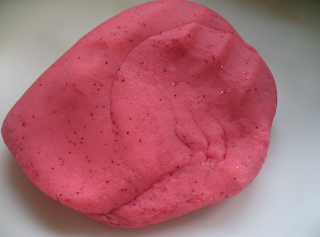 You could also make some homemade play dough if you don't want to buy any. We made this one a couple years ago and the kids loved it! I love this idea! Too cute! But I was not able to print get the bag topper. Is there any way I can get it? I would greatly appreciate it. Thanks! It worked for me now. Thank-you so much! I am a childcare provider and would love to do this for my children. Thanks again! Thanks so much for linking up this precious idea to my Valentine Link Party! I appreciate you doing that! So cute!! 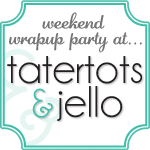 I would love it if you would share it at our sharing party at http://craftymomsshare.blogspot.com/2012/01/sharing-saturday-3.html. Thank you! I'm your newest follower. SUPER cute! I love the little saying! 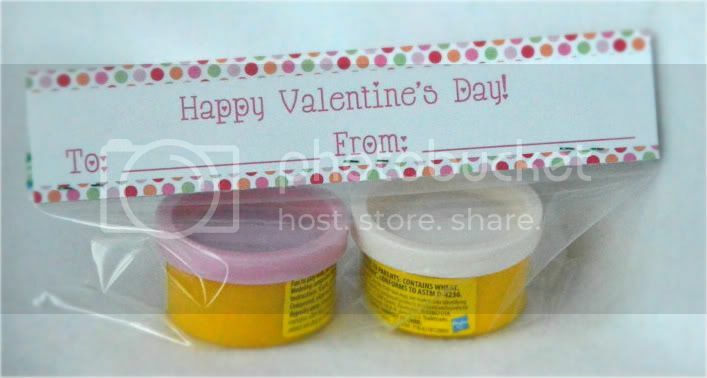 I shared a Play-Doh Valentine on my blog today:) I used the bigger cans though and added a sticker to the lid instead of putting them in bags. I wanted to print out your valentine playdog bag topper, but I can't get it to work. Can you check the link? I LOVE your blog!